Located in Timbuck II Shopping Center, Corolla, the Buccaneer’s Walk Shopping center, Kitty Hawk (right next to Captain’s Frank), and the Waterfront Shops in Downtown Manteo, Big Buck’s Homemade Ice Cream has been serving Outer Banks customers since 1994. Big Buck’s Ice Cream is dedicated to serving the very best in super-premium ice cream, cakes, smoothies and more! Our ice cream is made from scratch daily using fresh milk, cream and sugar. These ingredients are then pasteurized to create a delicious, creamy and natural ice cream. What’s more, this incredible ice cream is available in a huge variety of flavors sure to satisfy even the biggest ice cream enthusiasts. For those looking for something other than ice cream, our sorbets are made from the best fruits available and are dairy-free. Or, try our sherbets for a refreshing, lower fat product. We also offer a full espresso bar, featuring hot and cold coffee drinks such as lattes and cappuccinos. 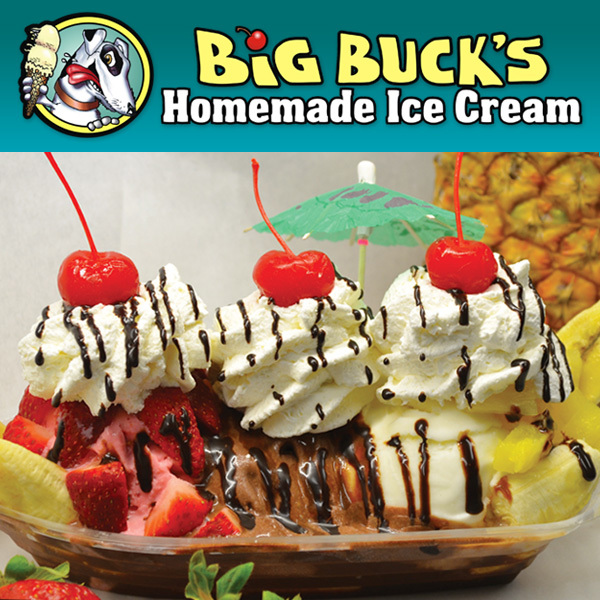 So stop into your nearest Big Buck’s and try one of our ice cream specialties. We look forward to serving you!